All Civil Defence personnel, regardless of rank, were permitted to wear medal ribbons above the left breast pocket (the right when seen from the observer). A large number of photographs from the period show CD members with first world war ribbons proudly worn. 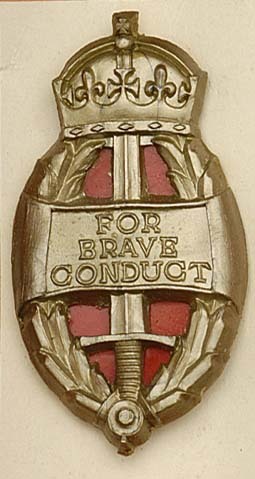 The King's Commendation for Brave Conduct was first issued in 1916 to recognise bravery by civilians. Up until 1943 the award came as just a certificate, from 1943 a plastic badge was issued to those receiving the commendation. From 1944 the small plastic badge was replaced by alternative insignia in the form a silver metal laurel leaf for civilians that could be attached to the Defence Medal ribbon if awarded or directly to the lapel. The first pattern badge was fixed with two pins, the second pattern via a small brooch fitting. Both badges were intended to be worn on civilian clothes (though there is photographic evidence of the badge being worn on the left pocket of the battledress blouse) and recipients were each issued with two badges. It was designed by George Kruger Gray.